Milton’s Cuisine & Cocktails executive chef Derek Dollar really digs Milton’s Acre, the restaurant’s 1-acre garden, and relishes sharing straight-from-the-vine dining experiences with his guests every Spring and Fall. Our Garden Dinner Series for 2019 will be kicking off on May 5th with a special Cinco de Mayo theme followed by May 19th, September 15th, October 13th, and our final one taking place on October 27th. Mouths typically start watering as soon as the first hors d’oeuvres and libations are passed during the evening reception. During this time, guests have an opportunity to tour Milton’s Acre. Then, it’s on to a memorable four-course meal of inspired comfort foods served family style under that stars accompanied by wine and the soothing sounds of a cellist. Menu items may include delicate squash blossoms stuffed with prosciutto and cream cheese or pimiento cheese and crawfish; or roast duckling with fingerling sweet potatoes, oyster mushrooms, heirloom snap beans and candied pecan apple butter. 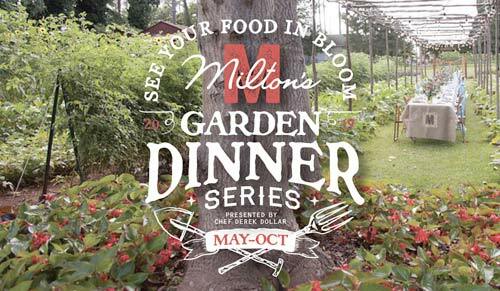 Tickets for each of our Garden Dinners are $125 per person. Tickets include wine, tax and gratuity. The dinners start at 6pm in May and 5pm in September and October. Tickets cannot be refunded within 48 hours of the event. Tickets are not transferrable for other dates. Please give us a call at (770)817-0161 if you have any questions.